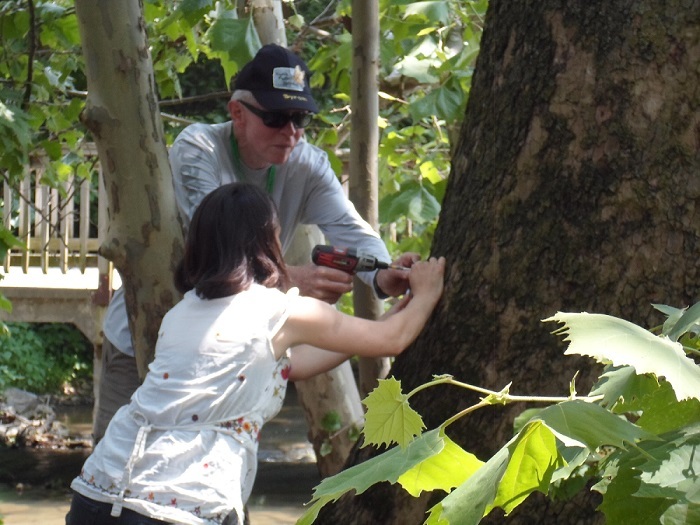 Byron and Anna Maria’s ceremonial placing of an ID tag on a sycamore tree. On a hot afternoon in early June, the 2015 training class for the Headwaters Master Naturalist chapter celebrated both the end of their first semester of study and the completion of their Spring skills project with a reception at Cooks Creek Arboretum in Bridgewater, Virginia. The twelve members of this year’s training class had undertaken to identify the various species of trees found in the small but lovely park. 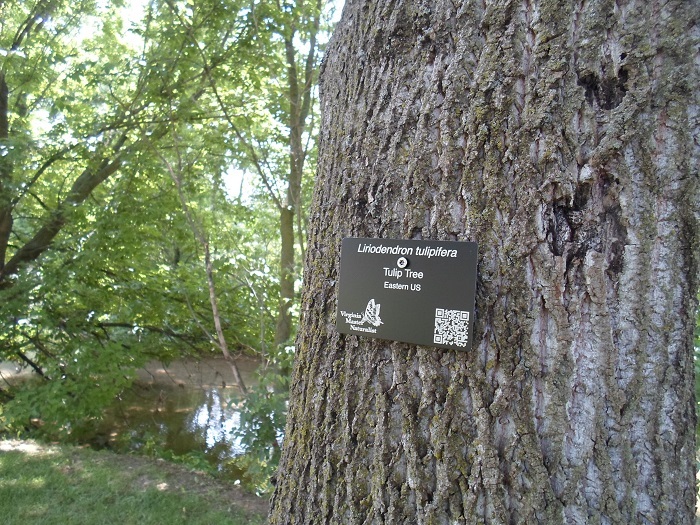 Visitors to the Arboretum can now find identifying markers on exemplar trees representing every species found there. Identifying markers were supplied by Plants Map, a Northern Virginia company which manufactures interactive plant tags for private gardens and public nature preserves such as Cooks Creek. Tagged tulip tree along Cooks Creek. Visitors and fellow students looked on as training class members Byron Hukee and Anna Maria Johnson ceremonially attached the final marker to the towering American Sycamore which grows on the banks of Cooks Creek near the entrance to the park. Guests were then treated to tea and spectacular ginger scones (baked by Training Class coordinator Roxanna Theiss), and guided walks through the park to view the markers and the many interesting plants which reside there. Each marker contains a QR code, which links to the Plants Map site, and provides information about the species of tree and about the park itself (including GPS coordinates of the labeled plants). In addition to tagging the trees in the Arboretum, the class also installed a marker for the Pollinator Garden found there—part of this year’s Monarchs and More! focus project designed to encourage the provision and protection of habitat for Monarchs and other Virginia pollinators. Chapter members and friends are encouraged to make a visit to see the work of the 2015 class and enjoy this gem of a park in Bridgewater! Peggy Plass helped to host the celebration. Byron with special guest Nick Cadwallender of PlantsMap.com. Kathy and Lacy lead a tour. July 1, 2015 in Projects.